SCOTTSDALE, Ariz. – Nov. 15, 2018 – Barrett-Jackson will usher in a new year of high-octane auction action during its 48th Annual Scottsdale Auction, featuring some of the world’s most coveted collector vehicles and authentic automobilia collectibles , January 12-20, 2019, at WestWorld of Scottsdale. As in decades past, The World’s Greatest Collector Car Auctions® will be the epicenter of Collector Car Auction Week and entertain thousands of automotive enthusiasts with interactive exhibits, entertainment and activities. Barrett-Jackson’s 2019 Scottsdale Auction will be home to some of the most coveted collector cars on the market, including a ʼ12 Lexus LFA Nürburgring Edition (preview). The ultimate in exclusivity, this supercar is one of only 50 built globally that is equipped with the Nürburgring package. Other supercars taking center stage in Scottsdale will include an ʼ01 Ferrari 550 Barchetta (preview). One of 448 produced to commemorate Pininfarina’s 70th anniversary, it is finished in Grigio Alloy and has only 28,000 actual miles. Domestic supercars, like an ʼ06 Ford GT Heritage Edition (preview), will also be among the most anticipated vehicles of the auction. Built to honor the 40th anniversary of the GT40’s 1-2-3 finish at the 24 Hours of Le Mans in 1966, this GT is one of 343 produced with the Limited Edition Heritage Livery. Rare and authentic domestic vehicles will also be a big mix of the Scottsdale Auction docket. Among the most anticipated is the very first Ford Pilot Plant/Pre-production 1965 Mustang hardtop (preview) to receive a VIN. 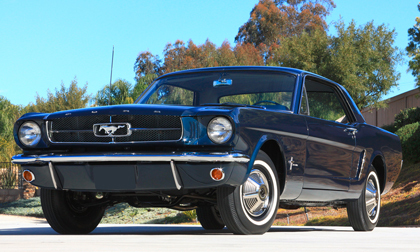 Credited with igniting the pony car revolution, this Mustang is a genuine piece of automotive Americana. Chevrolet will also be well-represented by some star cars on the docket, including a ’54 Corvette Custom Convertible (preview). This Ridler Great 8 award-winner known as “Transitions” was a six-year build by Larry Griffey’s Hot Rods & Restorations that combines the stylish looks of the ʼ54 Motorama Prototype with modern-day technology, handling and performance. Another high-quality Chevrolet custom build is Art Morrison’s custom ’60 “3G” Corvette (preview). Designed to produce 1G on the skid-pad, 1G of acceleration and 1G of braking, this custom integrates modern luxury performance with classic styling and design. The 2019 Scottsdale Auction preview docket is now available to view online. Click here to consign a vehicle or visit Barrett-Jackson.com/Bid for information on becoming a bidder. Advance tickets, nine-day ticket packages and information on VIP Packages are available at Barrett-Jackson.com. Also, follow Barrett-Jackson on Facebook, Instagram, LinkedIn and Twitter for the latest news and information heading into the 2019 Scottsdale Auction.